As the EMS adage goes, “If you’ve seen one EMS system, you’ve seen one EMS system.” While that statement reflects the diversity of EMS systems across the United States, it also creates the false sense that every EMS system is entirely different and that EMS leaders can’t learn from each other. Clearly that is not the case. As we see in the premiere edition of the EMS Trend Report, EMS systems across the country share many traits. On the other hand, significant differences do exist in everything from clinical care to salaries to operational benchmarks to hiring requirements. In this special report, from Fitch & Associates in cooperation with EMS1 and the National EMS Management Association, see how your agency compares to others around the country. The issue also features analysis and reaction from EMS experts about the importance of performance measurement and paramedic degree requirements, as well as roundtable discussion about the most interesting findings of the EMS Trend Report, how those findings might be best applied and what we might expect to see in future years. There is a principle in physics that says you can either know where an object is, or how fast that object is moving—you can never know both at exactly the same time. 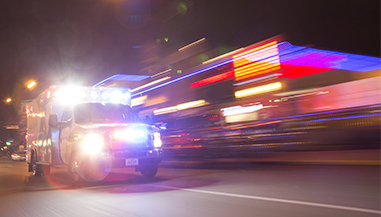 Trying to take the pulse of the nation’s EMS system can face the same challenge—while some things seem to stay stagnant, many aspects are changing so quickly that by the time they are measured and analyzed, they are no longer the same. The Fitch/EMS1 Trend Report is not only about measuring where EMS is today, but also how fast—or slow—it is moving, and in what direction. Instead of attempting to survey thousands of self-selected agencies that can change from year to year, we focused on a smaller but still representative group of EMS agencies that agreed to take the time year after year to provide detailed information about their clinical care, operations, finances and more in order to examine trends within the industry. The agencies selected to participate are not necessarily the “best,” or the biggest. Instead, they represent a range of service-delivery models and sizes, in diverse geographic and demographic settings. As you’ll see in the report, they are diverse in many other ways—from clinical protocols to operational procedures. Fitch & Associates, EMS1 and NEMSMA thank each organization that volunteered to participate in this effort. Without your willingness to share information for the betterment of patients and EMS systems everywhere, this project would not have been possible. There are a wide variety of EMS system throughout the United States that represent an assortment of system models, designs and structures. To reach the largest number of agencies, numerous outlets were used to solicit voluntary participation. These included the EMS1.com website, email contacts from Fitch & Associates and the National EMS Management Association (NEMSMA), social media platforms such as Facebook and Twitter, and press releases from industry partners. The survey was open for a 12-week period in 2015. Applicants were asked to complete a basic intake survey, after which staff at Fitch & Associates provided each applicant with an individualized survey link to complete the data entry process online. Applicants, especially those who did not fully complete the survey mechanism, were contacted with follow-up inquiries. Staff at Fitch & Associates collected, aggregated and analyzed the data. Every effort was made to ensure that sufficient data points were reported by region and system configuration while still providing anonymity to the individual reporting agencies. A total of 94 agencies—the “Fitch/EMS1 Cohort”—participated in the survey. Not every department was able to provide answers for every question, so some questions reflect the responses of a subset of the agencies surveyed. More information about the survey respondents is available in the Survey Demographics section later in the report. While an expanding research base and move toward evidence-based care has likely created more consistency in clinical protocols used across the country, some significant differences clearly still remain. Certain procedures and equipment are used by only a minority of agencies in the survey. Others have seen rapid adoption or decrease in use in recent years. For example, more than half of the Fitch/EMS1 Cohort now report using mechanical CPR devices such as the LUCAS or Autopulse. Yet at the same time, only a quarter report the routine use of impedance threshold devices (ITD) for cardiac arrests. This being the first year of the Trend Report, it will be interesting to follow whether ITD use increases or decreases in future years as the evidence of its effectiveness continues to be debated by experts in the field. Perhaps not surprisingly, nearly every agency reported use of continuous positive air pressure (CPAP), a device that just 15 years ago was probably only used in a small number of systems. What procedure, medication or device will be the next to so dramatically change EMS care? Currently, fewer than 5% of the Fitch/EMS1 Cohort use ultrasound in the field—it will be interesting to track that number over the next few years to see if more agencies decide ultrasound is a useful prehospital tool. Another trend to follow will be the use of hypothermia in resuscitation. Fewer than half of the agencies reported that their protocols included therapeutic hypothermia for cardiac arrest. The release of the most recent American Heart Association resuscitation guidelines, which recommended against prehospital use of cold saline to induce hypothermia, occurred as this survey was being conducted. While the guidelines did not say to stop cooling in the prehospital environment, some agencies likely removed post-resuscitation hypothermia from their protocols completely, while others may have turned to an alternative method, such as ice packs. The economy’s slow but steady recovery seems reflected in EMS budgets. The majority of the agencies in the survey reported either no change or small increases in budget dollars over the previous year, while fewer than 10% reported a decrease. At the same time, almost none increased the budget by more than 4%, and with rising expenses and call volumes in many areas, these minimal increases are forcing many EMS organizations to try to do more with less. Personnel costs represent the largest chunk of the budget for most agencies, meaning stagnant budgets are likely leading to only modest, if any, increases in salaries or benefits. Historically, emergency telecommunications jobs were considered positions for field providers who could no longer perform those duties, or as entry-level positions. But recognition of the critical role of 911 call-takers and dispatchers, and the stressors and demands of the job, has led to a professionalization of the role and along with it, increases in pay. In fact, agencies report higher typical starting salaries for telecommunicators than EMTs in the field; paramedics continue to earn more, however. Interestingly, the survey respondents were evenly split with half using a third-party vendor for ambulance billing and half using in-house staff. The impact of ICD-10, along with future changes to Medicare and Medicaid reimbursement policies, will likely drive how quickly and in which direction that answer shifts in future years. Certain indicators, such as return-of-spontaneous-circulation (ROSC) in cardiac arrest and the ability to identify ST-elevation myocardial infarction (STEMI), have been used to measure clinical performance for years and remain in widespread use in EMS systems. In contrast, other measures have not yet been widely accepted, such as pain management, recognition of sepsis or heart failure, and use of physical or chemical patient restraints. About half reported measuring pain management, for example, while the vast majority said they track their providers’ ability to identify STEMI. The clinical indicators used demonstrate that some agencies still struggle to measure the right things, either due to lack of access to data or simply tradition. Nearly every agency is tracking ROSC, while slightly fewer track survival-to-hospital-discharge, even though the latter is considered to be a more patient-centered and appropriate measure of the performance of the emergency care system. Clearly, more EMS agencies need to have access to outcome information and other data from hospital systems and other sources in order to appropriately measure and improve the quality of care they provide. Response time analysis continues to be somewhat controversial in EMS. In recent years, an effort to focus on clinical and outcome measures has led many to argue that response time measures are outdated and irrelevant. However, response time is still an important measure for any EMS system, as it is critical in certain, rare situations (such as sudden cardiac arrest) and response time goals are often embedded in contracts and budgets. However, survey respondents differed widely on how they measure response time—a problem given that many compare themselves to each other and to benchmarks, such as the National Fire Protection Association (NFPA) standards. This survey found that 26% of respondents, for example, started the clock for response time when the phone was answered in a dispatch center, while 47% started measuring when the unit was notified. About two-thirds of the organizations surveyed said they measure 90th percentile times, while the rest measured average response times. This lack of consistency can lead to unreal expectations, and often impact budget and resource allocation decisions. The widespread adoption of the Institute for Healthcare Improvement’s “Triple Aim” has led to increased use of patient satisfaction as a measure in healthcare, including for determining levels of reimbursement. EMS has joined this movement, but lags behind its healthcare partners. About half of respondents are not formally surveying patients, instead relying on unsolicited complaints or comments to assess patient satisfaction. About a quarter of agencies are using a third party to measure patient satisfaction—and that number is only expected to grow as more EMS agencies try to demonstrate community support. In recent years, the EMS community has debated whether more education should be required of paramedics. Some have argued that paramedics should at minimum have an associate’s degree; others have pushed further, saying that bachelor’s degrees should be necessary. Of the agencies who responded, fewer than 10% require paramedics to have an associate’s degree at this time, and none require a bachelor’s. However, it will be interesting to see if that changes in future years—more than 60% of respondents think an associate’s should be required. Whether reality catches up with those opinions will likely be determined by many factors, including the economic impact and the availability of qualified paramedics. 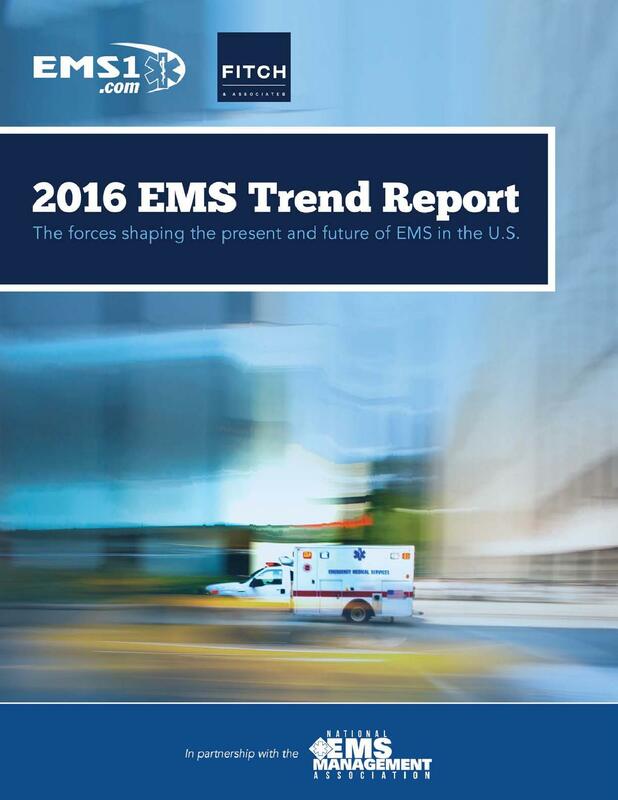 The 2016 Fitch/EMS1 Trend Report establishes a baseline for evaluating trends in the EMS profession as organizations in the Fitch/EMS1 Cohort grow, innovate and mature over the years. With the EMS Agenda for the Future turning 20 this year, and an updated Agenda in the works, the Fitch/EMS1 Trend Report will give our profession the opportunity to evaluate our current state and examine our progress toward achieving the goals we set for the next several decades. Take a look at the results of the survey and consider what they might look like next year, in five years, or in twenty. When we look back at this first Fitch/EMS1 Trend Report in 2036, what will it tell us about the next two decades of EMS?